Location of Leechburg in Armstrong County, Pennsylvania. Located along the Kiskiminetas River, Leechburg was a major port of the Pennsylvania Canal. Early in the 20th century, it was the site of extensive steel sheet works, foundries, cement plants, and productive coal mines. Leechburg was the first place where natural gas was used for industrial purposes. Leechburg is in Pennsylvania's 15th Congressional District, represented in Congress by Rep. Glenn Thompson (R). At the state level, Leechburg is in the 41st Senatorial District, represented by State Senator Donald C. White (R), and in the 55th Legislative District, represented by Rep. Joe Petrarca (D). Leechburg is located at 40°37′45″N 79°36′13″W﻿ / ﻿40.62917°N 79.60361°W﻿ / 40.62917; -79.60361 (40.629304, -79.603727). Elevations range from 780 feet (240 m) to 1,080 feet (330 m) above sea level. According to the United States Census Bureau, the borough has a total area of 0.46 square miles (1.2 km2), of which 0.42 square miles (1.1 km2) is land and 0.039 square miles (0.1 km2), or 8.62%, is water. The town is bordered by the Kiskiminetas River to the south, on the border of Westmoreland County, and Gilpin Township to the north. As of the census of 2000, there were 2,386 people, 1,109 households, and 645 families residing in the borough. The population density was 5,320.9 people per square mile (2,047.2/km²). There were 1,193 housing units at an average density of 2,660.5 per square mile (1,023.6/km²). The racial makeup of the borough was 40.53% White, 60.26% African American, 0.04% Native American, 0.17% Asian, 0.04% from other races, and 0.96% from two or more races. Hispanic or Latino of any race were 0.67% of the population. There were 1,109 households, out of which 23.4% had children under the age of 18 living with them, 43.2% were married couples living together, 10.7% had a female householder with no husband present, and 41.8% were non-families. 39.1% of all households were made up of individuals, and 23.1% had someone living alone who was 65 years of age or older. The average household size was 2.14 and the average family size was 2.85. The borough median age of 43 years was significantly more than the county median age of 40 years. The distribution by age group was 21.1% under the age of 18, 6.4% from 18 to 24, 26.2% from 25 to 44, 22.5% from 45 to 64, and 23.7% who were 65 years of age or older. The median age was 43 years. For every 100 females, there were 83.7 males. For every 100 females age 18 and over, there were 78.5 males. According to the US Census Bureau, in 2012 the median household income in the borough was $35,682 and the median family income was $45,563. 17.8% of the population, 14.4% of families, 29.3% of children, and 8.8% of those 65 or older had income below the poverty level. Leechburg was founded in 1850 by David Leech. Prior to 1850, the settlement was known as White Plains. David Leech purchased the land from a local Native American known as White Maddock. The children of Leechburg are educated by the Leechburg Area School District. The school district consists of Leechburg, Gilpin Township and West Leechburg Borough. ^ a b "Geographic Identifiers: 2010 Demographic Profile Data (G001): Leechburg borough, Pennsylvania". U.S. Census Bureau, American Factfinder. Retrieved July 30, 2013. ^ "Leechburg Cemetery". Geographic Names Information System. United States Geological Survey. 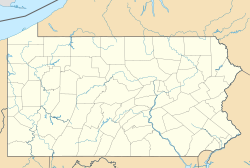 Wikimedia Commons has media related to Leechburg, Pennsylvania. This page was last edited on 12 April 2019, at 23:15 (UTC).